The hawkish House Republican with a famous last name is seen as a possible senator or even speaker of the House. 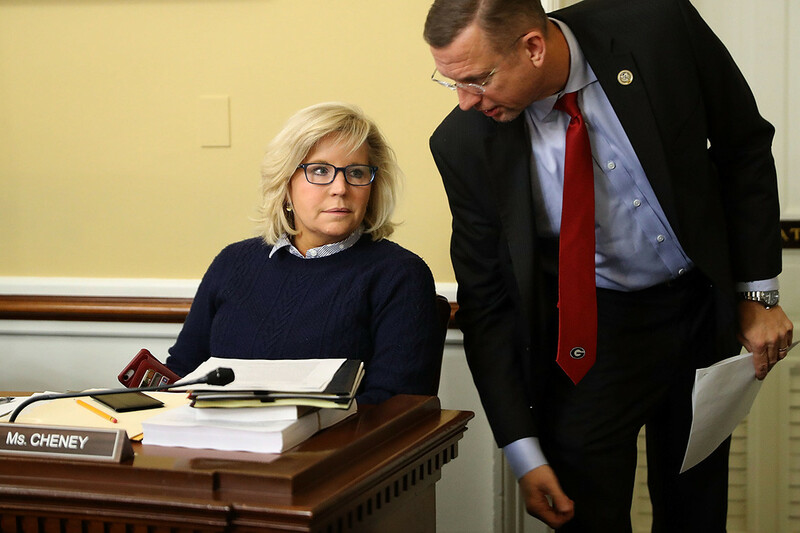 Just months into her first term in office, Rep. Liz Cheney went nose-to-nose with then-Speaker Paul Ryan at a private meeting with GOP lawmakers. The Wyoming Republican was frustrated that GOP leaders weren’t seeking a big enough budget increase for the Pentagon and told Ryan to change course. “She got in Paul’s face,” said Rep. Bradley Byrne (R-Ala.), another defense hawk who was in the room. “I think her being willing to stand up in her own way, and be as forceful as she is, I think that changed everything around.” Not long after, GOP leadersdelivered a windfall of more than $100 billion for the military. The confrontation offered an early preview of the aggressive style that helped propel Cheney to the No. 3 GOP slot in the House earlier this month. The 52-year-old second-term lawmaker has emerged as one of the top faces of the House GOP, with Republicans relishing her eagerness to attack against House Democrats. After November’s 40-seat wipeout, Cheney’s rise is seen as one of the few bright spots for the party. And her rapid ascent has fueled speculation that she could soon land in the Senate or become the first female Republican House speaker. Cheney is a loyal defender of President Donald Trump on cable news at a time when plenty of other top Republicans have spurned such PR duties. But she’s also unafraid to challenge the White House on issues like the withdrawal of U.S. troops from Syria. Some Republicans say Cheney has become their preferred messenger — even more so than House Minority Leader Kevin McCarthy and Minority Whip Steve Scalise — at what feels like a low point for the party. Liz Cheney, who declined to be interviewed for this story, has been willing to charge ahead of senior lawmakers. By the end of her first term in the House, Cheney phoned her colleagues to announce she was running for GOP conference chair — seizing the post from Rep. Cathy McMorris Rodgers of Washington, who eventually decided not to run for it again. This month, Cheney became the first House Republican leader to take aim at Rep. Steve King (R-Iowa), just hours after the New York Times published explosive comments in which he defended white supremacy. She then called for King to resign at the same time that McCarthy was planning to allow King to keep least one of his committee slots, according to multiple GOP sources. McCarthy ultimately decided to pull King from all his committee assignments but has not called for his ouster. A a longtime foot soldier in national Republican politics, Cheney has displayed a political intuition that could help the GOP mount a comeback in 2020, lawmakers and aides say. As conference chair, she’s already begun to reshape the GOP’s messaging arm, launching a campaign-style “rapid response” team to hammer House Democrats in their newfound majority. She also distributes internal talking points to her own members in a weekly email Listserv she dubs “the trailblazer” after her Wyoming roots. Some GOP lawmakers, though, have begun to wonder whether Cheney would leave the House and run again for Senate if GOP Sen. Mike Enzi retires. Her first bid against Enzi, a soft-spoken and popular incumbent, sparked intraparty warfare and ended in failure after just six months. “I don’t want her to go to the Senate, but look, she could be an extraordinary high-profile leader for the Republican Party over the next generation,” added Cole, a former chair of the House GOP’s campaign arm. Others think Cheney has a history-making turn in the House. “I’ve told many people here, I think she would be a natural to be the speaker in the House. I mean that,” Byrne said. Republicans say Cheney overcame skepticism within her own party after having entered the House with a storied political background — and, of course, a famous father — though she had never held elected office. She still butts heads with other Republicans, often in impromptu policy duels over military and national security issues. But even veteran lawmakers said they couldn’t help but be impressed by her ability to launch into complex debates over U.S. surveillance policies for foreign spies or the differences between the military’s fleets of F-35s and F-22s. As a first-term member, Cheney spoke up infrequently at Republican Conference meetings, but when she did, she delivered forceful messages, usually relating to the Pentagon. Sometimes, she even flipped votes. Lawmakers say Cheney’s bare-knuckle offense could help rebuild House Republicans’ morale, after the party suffered its worst drubbing at the polls since Watergate. “She’s giving our conference a lot of confidence that we’re headed in the right direction,” said five-term GOP Rep. Bill Johnson of Ohio. Cheney is also likely to try to play a unifying role as the fractious House GOP becomes the first line of defense for Trump in a slew of Democratic probes this year. She’s made an effort to sit in on meetings of various GOP caucuses since joining GOP leadership, including the centrist Tuesday Group and the conservative Republican Study Committee, while also holding informal talks with members of the hard-line House Freedom Caucus. “What I think you are seeing is an incredibly cohesive conference during an incredibly difficult period,” Rep. Susan Brooks (R-Ind.) said. Brooks, who is among just 13 Republican women left in the House, is the lead recruiter for the party’s House campaign arm; she hopes Cheney’s high profile will attract more female voters and more female candidates in 2020. Cheney, who once worked to boost women’s empowerment in the Middle East as a State Department official, helped organize a women-centric campaign for the Bush-Cheney reelection ticket in 2004. That initiative — “W Stands for Women” — targeted single and suburban women, which is the same group that voted decisively against GOP candidates last fall. Next articleWatergate Created Roger Stone. Trump Completed Him.